Although a lot of web, print, and air space has been devoted to a certain word beginning with the letter N that President Obama used while a guest on Marc Maron’s WTF podcast last Friday, there was so much more in the interview worth highlighting and remembering. For more than an hour, Obama spoke candidly with Maron on a variety of issues, including racism in America, the Affordable Care Act, the divide between the left and right, why the presidency is a little like middle management, the time when Obama was most disgusted with Congress, why Obama doesn’t get stressed out anymore, Obama’s college years, Obama’s father, Obama’s daughters, and Obama's favorite comedians. As always, Maron conducted the interview and recorded the podcast from his garage in Los Angeles, California. Here, what I’d like to highlight aren’t the political issues that Obama tackled in Maron’s garage but a few points Obama made which I believe to be useful to current and future leaders and managers alike. Let’s call them leadership lessons. And so, here are three leadership lessons culled from last Friday’s WTF podcast. 1. Putting subordinates at ease will result in more productive meetings and work. At the outset of the podcast, before President Obama showed up for the interview, Maron was a nervous, stressed-out wreck. Which is completely understandable. After all, the President of the United States was minutes away from visiting his garage to talk to him. And Maron is a comedian and actor, not a statesman or politician, and Obama is by far the most powerful person Maron has ever had on his show. A couple minutes later, when Obama arrived, you can hear the president immediately putting Maron at ease. He compliments Maron (“you’re a big cheese now,” he says to Maron), doesn't put on any airs, and you can tell right away that Maron has grown comfortable in Obama's presence and all that nervousness of Maron's has disappeared. What ensues is an interesting, relaxed, revealing discussion between the two men. Which could not have been achieved if Maron had remained nervous and anxious. Of course, Obama, the so-called Leader of the Free World, had been in similar situations before, numerous times, and knew that Maron would likely be nervous and anxious to speak to him. He also knew that if Maron didn’t relax, then the discussion would not be as successful as it could be. In any case, this tactic of making a subordinate, employee, interviewee, or interviewer feel comfortable and relaxed can and should be used daily by leaders and managers. And it’s important to remember that making others feel better is not the goal (though it does have that effect); rather, the goal is to have as productive and successful meeting as is possible. In my experience, people are at their best when comfortable and relaxed. They feel freer to share their ideas aloud and are more likely to take risks in what they say and offer. They’re also usually more open to criticism and don’t take things as personally. And so, they’re able to continue to speak freely and offer their ideas. That is, they won't close down. All of which leads to greater productivity. 2. Small changes now will effect big changes later. Obama spent a fair amount of the podcast addressing his detractors; at one point, he said that a lot of people, even in his political party, have told him they wished he had made larger changes during his presidency. 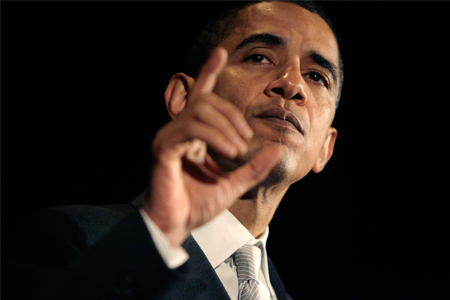 "There are a lot of people running the country from their couches," Obama said. After which Maron said, "For a few years I ran the country from my couch, too." Obama went on to say that significant changes often begin with what appear to be a minor changes. He said that a lot of what governing consists of is changing the course of the ship just 2 degrees. And if you do that, he explained, over time the ship has gone in a completely different direction. He also explained that you can't make a 50-degree turn or else the ship will tip over. In other words, what might appear to minor changes now can, over time, result in rather significant ones. This analogy can be applied to leading and managing (among other things, including personal growth). Just a minor tweak in how a business is operated, or in how you lead, or in your management style can lead to large changes that are not discernible now. And so, don't lament that you can't make a hard right; just make a change in direction now, however small it might look. 3. Practice, experience, and failure lead to fearlessness and competence. Near the end of the podcast, Maron confessed to Obama that he was a nervous, stressed out maniac before the president arrived. The comedian then said something like, But I'm sure you weren't, right? To which Obama said that no, he wasn't at all, adding that if the president were stressed out over having to appear on a podcast then there would be big problems, meaning that he has a lot of life- and world-threatening issues to deal with on a daily basis and so there's no space or time to be nervous for a podcast. Maron went on to ask Obama how he deals with all the appearances and speeches and decisions and meetings that he has to make on a daily basis. Obama answered by saying that one of the things that strikes him when he reads a lot about comedians is that comedians always mention that comedy is a craft, something practiced over time that one gets more proficient in. Obama said that the things he deals with aren't all that different, and that now he has so much experience, having been the president for more than six years, that he longer has any fear. That is, he doesn't get stressed out over much of anything anymore. He added that he has had enough failures to know that if he makes a mistake he will survive. Which is why, he said, now he would make a much better candidate than he was in 2008. Indeed, like other crafts, the act of leading, of holding meetings, of making decisions, of hiring all improve with experience. And with experience and repetition comes less (and maybe no) fear. 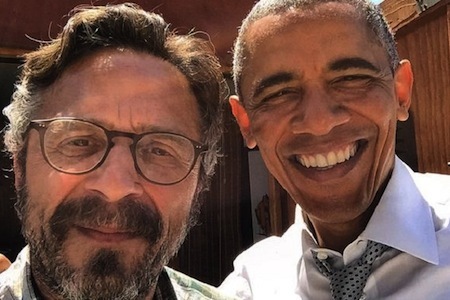 And so, maybe the next time Maron interviews Obama, or another high-ranking, powerful person, he'll be a lot less nervous, and perhaps won't be nervous or anxious at all.